The Linux/Unix systems are multi-user systems and each file and directory has its own permission. This is in fact can be related to the origin of Unix which was conceived as a network system with multi users simultaneously working in the same environment. In that case, it is important to distinguish each file and directory's access rights to keep it secure. It is important to control which user has the right to modify or delete any file or directory. This basically represents that the file info.txt was created on Dec 12, at 13:10 and has a size of 1201 bytes. It belongs to the group "users" and is owned by the user "ambarish" in particular. -rw-r--r--, drw-r--r-- basically represents the file permission. 1 - denotes the file type. a hyphen (-) denotes a regular file. "d" denotes a directory. 2,3,4 denotes read, write, execute permissions for the owner of file. 5,6,7 denotes read, write, execute permissions for members of group owning the file. 8,9,0 denoted read, write, execute permissions for all other users. The permission can be assigned to any file or directory using the octal number system. 4 represents read access, 2 for write and 1 is for the access to execute. So, if you want to assign a file read / write / execute access, it will be 4+2+1=7. will change the file access rights such that owner, group, and others and read, write and execute the file. You have to work out with the numbers. 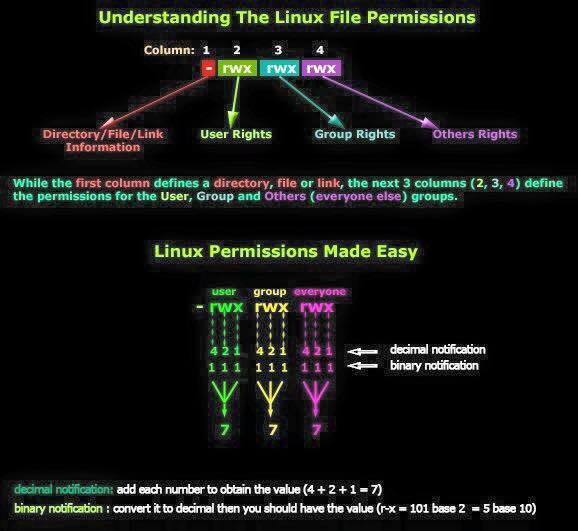 Here's an infographic showing the file permissions in Linux/Unix. Anything I missed? Please add it in the comments section.